The success of our club’s meetings depends on our members. 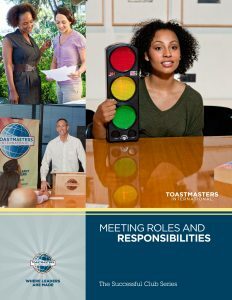 In Toastmasters, we learn by participating. There are many roles to fill and all meeting participants play an important part in making the club experience both educational and enjoyable. Following are the roles we are called upon to fulfill, with links to tips for doing a good job. Roles and responsibilities may vary slightly from club to club, so check with your Vice President of Education or Mentor when you are assigned a role. Click on the Role name below for more information directly from the Toastmasters International website. Invites guests to participate in Table Topics™. If they agree, the Topicsmaster ensures they have an opportunity to speak.